Old BPM = Write the numeric value for the BPM on the bar before the metric modulation took place. For this example, the quarter note will equal 120bpm. Take the equaled notes on top of the metric modulation. Figure out the Greatest Common Factor between these two rhythmic figures. What is the biggest rhythmic figure that could divide both equaled notes? Express the equaled notes in this figure. The number left of the equal sign is your OPN. Write it in the OPN blank field of the calculator. The number right of the equal sign is your NPN. Write it in the NPN blank field of the calculator. 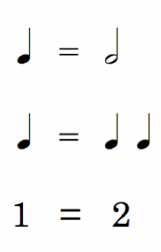 Before the metric modulation the quarter note equaled 120 BPM, after the metric modulation the quarter note will equal 60 BPM. If you'd like to learn the story behind this calculator, read the February 4th, 2015 post of the "Learn" section.